Corresponding author. E-mail address: yangxl@cau.edu.cn (X. Yang). Abstract: Allatostatins (ASTs), a family of insect neuropeptide, can inhibit juvenile hormone (JH) biosynthesis by the corpora allata (CA) in Diploptera punctata, and therefore be regarded as potential leads for the discovery of new insect growth regulators (IGRs). But several shortcomings, such as their sensitivity to peptidases and high cost, impeded their practical application in pest management. In order to discover new IGRs, one ASTanalog B1 possessing non-peptide group was discovered with high ability to inhibit JH biosynthesis in vitro (IC50:0.09 μmol/L) in our previous studies. In the present work, two series of B1 analogs with different substituents on the N-terminus region were designed and synthesized. The result suggested that benzene showed better activity than other heterocycles, and the para-substitution on the benzene was beneficial for activity. Moreover, analogs with logP value over 2.0 exhibited good activity, which indicated the hydrophobicity is important to the bioactivity. Three dimension quantitative structure-activity relationship (3D-QSAR) studies were performed to highlight the structural requirements of ASTanalogs, which demonstrated introduction of bulkier substituents on the N-terminus would increase the activity. Analog II12 (IC50:0.08 ǌmol/L) exhibited similar inhibitory activity to the lead B1, but its synthetic route was simpler than B1. Therefore, II12could be used as a new lead compound for the discovery eco-friendly IGRs. Thanks to the virtue of high potency, good selectivity and ecofriendly safety, insect growth regulators (IGRs) are regarded as 'the ideal pesticides in the st century . The discovery of new IGRs has therefore become increasingly important in pest control both in agriculture and public health. The FGLamide allatostatins (FGLaASTs), originally isolated from the cockroach Diploptera punctata in 1989, have 6-18 amino acids and inhibit juvenile hormone(JH) biosynthesis by the corpora allata . Allatostatins (ASTs) also exhibited pleiotropic functions including modulation of myotropic activity in both gut and dorsal vessel , inhibition of vitellogenin production in the fat body , stimulation of carbohydrate enzyme activity in the midgut . With these abilities to influence a number of physiological processes, especially inhibition of JH biosynthesis in some insect species, ASTs were regarded to be potential leads for the discovery of new IGRs. However, some shortcomings, such as their susceptibility to both exo- and endopeptidases in hemolymph and tissues of insects and high production cost, preclude their application in pest management . To find analogs that overcome these limitations while retain activity, structural modifications and structureactivity relationships (SARs) have been carried out in recent years. There are several susceptible hydrolysis sites in the core pentapeptide of the FGLa-ASTs which shared a common conserved C-terminal sequence Y/FXFGL-NH2 (X = A, N, G, and S) for activity . The primary site is between Y/F and X residue, which was susceptible to cleavage by the enzymes of hemolymph [8, 9]. Replacing the specify amino acids with non-amino acid, Nachman had synthesized some ASTs analogs which retained the ability of inhibition JH biosynthesis and displayed resistance to degradation . Kai replaced Y with a non-peptide structure (aromatic group) and obtained some analogs with enhanced resistance to peptidase hydrolysis . Using the peptidomimetics strategy, Xie found a new simple mimic B1 for T/YXFG, with higher activity than the lead core pentapeptide . Previous study demonstrated that these positions tolerated a range of non-amino acid replacement. Introduction non-amino acid groups can not only protect peptidase-susceptible sites but also reduce the production cost. With the purpose to study the substituents effects of the N-terminus region on JH inhibitory activity and to explore the structure-activity relationship as well as to highlight the structural requirements of AST analogs for further discovering new analogs with higher activity and simpler structure, we designed two series of ASTs analogs by modifying the N-terminus region of lead B1 via replacing 1H-benzotriazole with aniline, heterocyclic amines or other substitutes (the design strategy is shown in Fig. 1). The target compounds were prepared via a simpler synthetic route in the present work and their structures were confirmed by 1H NMR, 13C NMR and HRMS. Their inhibition of JH biosynthesis against Diploptera punctata was evaluated in vitro and the preliminary structure-activity relationship was analyzed. In addition, 3D-QSAR studies were performed to explore the vital factors for designing new IGRs candidate. The synthesis of analog B1 (1) and analog II12 (2) was illustrated in Scheme S1 (Supporting information). The rest analogs were obtained using the same synthetic route (2). Leu with resin was synthesized from Rink amide-AM resin (1 equiv.) using the standard Fmoc/tBu chemistry and HBTU/HOBt protocol [12, 13]. Fmoc–Leu–OH (3 equiv.) was activated with HBTU (3 equiv. ), HOBt (3 equiv.) and DIEA (6 equiv.) in DMF for 5 min, and couplings were run for 4 h. Removal of the N-terminus Fmoc group from the residues was accomplished with 20% piperidine in DMF for 20 min. Compound 2 was obtained from compound 1 (8 equiv.) which was coupled to the Leu with resin with Dic (4 equiv.) in DMF for 4 h at room temperature . The product with the resin was prepared by the acyl reaction of compound 2 with 4-aminobenzotrifluoride in DMF for 8 h, and then the product was cleaved from the resin with TFA containing 5% water for 2.5 h at room temperature. The crude compounds were purified on a C18 reversed-phase preparation column with a flow rate of 10 mL/min using acetonitrile/water (50:50) at room temperature. UV detection was at 215 nm. The physical and identification data (melting point, 1H NMR and HRMS of all target compounds and 13C NMR of typical analogs I2 and II12) are given in the Supporting information. The method involves the acyl reaction and solid phase peptide synthesis. Using the reported method , the lead B1 was obtained totally in nine steps and twice purification. The key intermediate compound 2 was cleaved with TFA and then the solution was purified on a C18 reversed-phase preparative column and freeze-dried in vacuum. The crude target compound B1 was obtained by repeating above purification steps. In the present work with purpose to simplify the route and reduce the cost, the compound 2 was directly reacted with 4-aminobenzotrifluoride followed by cleavage and purification, and we successfully obtained the target compound II12. Comparing to lead B1, the route of II12 was shortened from nine steps with twice purification to eight steps with once purification. Moreover, the dosage of HPLC grade solvent used in target compounds preparation was reduced by half. Natural ASTs are susceptible to inactivation in vivo as a consequence of hydrolysis by hemolymph and poor penetration through the insects. The primarily hydrolytic site of the core pentapeptide between the residues Y/F-X and the other hydrolytic site such as G-L was also detected . Analogs with modification and replacement of amino acids at the hydrolysis not only showed resistance to peptidases but also retained their bioactivities. In our previous study , analog B1, a new mimic for Y/FXFGL in which Y was replaced with 4-(1H-benzo[d][1,2,3]triazol-1-yl)-4-oxobutanoic acid, showed good inhibition activity without hydrolytic site. To find new analogs with higher bioactivity and lower cost, further optimization on B1 was carried out in present work. As shown in Fig. 1, the first step of the strategy was to replace the N-terminus 1H-benzotriazole with aniline and heterocyclic amines (Series I). The bioassay result indicated that analog I1 with N-terminus containing benzene showed the best activity. We subsequently selected I1 as the second lead, and a series of analogs Series II) with different substituents on benzene at the N-terminus were designed and synthesized to explore the substituent effect on the benzene ring. 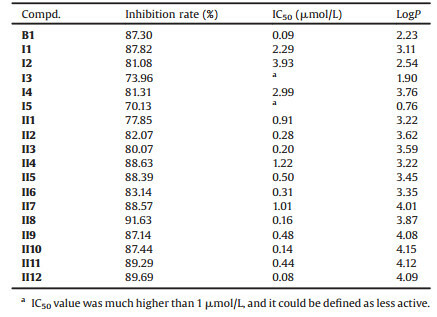 According to the results shown in Table 1, most of the target analogs showed obvious ability to inhibit JH biosynthesis by the corpora allata (CA) of D. punctata in vitro at 1 ×10-5 mol/L. Analogs showing inhibition rate more than 70% were chosen to determine their IC50 values. The results indicated that these analogs had different potencies owing to vary modification at N-terminus. Series I (I1–I5), in which aniline and heterocyclic amines mimicked the 1H-benzotriazole region, showed lower activity than B1. However, analog I1 showed the best activity compared to other analogs of series I and therefore was chosen to be the second lead for further optimization. Fortunately, we found that the activities of series II were higher than that of series I. Fig. 2 clearly exhibited that different positions of substituents on the benzene ring at N-terminus can lead to different activities. 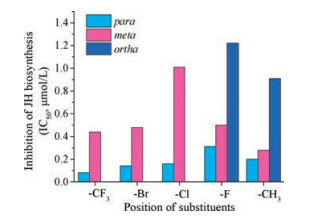 In particular, substituents in the phenyl para-position were beneficial for activity compared with meta- and ortho- substituents (p-F (II6) > m-F (II5) > o-F (II4)). Meanwhile, in the same para-position on the phenyl ring, the electron-withdrawing substituents contributed to better activity than that of electron-donating groups, such as (p-CF3 (II12) > p-Br (II10) > p-Cl (II8) > p-CH3 (II3)). However, compound II6 with p-F was an exception due to the following reasons: (1) The activity might be also associated with its steric effect and the radius of fluorine atoms is smaller than methyl group; (2) The hydrophobicity capacity may be benefit for its activity and the lipophilicity of II6 was weaker than that of II3. Compound II12 (p-CF3) exhibited the highest activity (IC50: 0.08 μmol/L), which was close to the st lead B1 (IC50: 0.09 μmol/L). In the previous work , it was supposed that the potency of the AST analogs may be related to their lipophilicity. To elucidate the relationship between hydrophobicity and the inhibition activity, the logP values of target analogs were calculated by the prediction system (Table 1). The results obviously exhibited that these AST analogs with logP values less than 2.0 exhibited poor activity (I3, logP = 1.9) and (I5, logP = 0.76). Analogs with logP more than 2.0 showed visible activity. This indicated that a suitable hydrophobicity may be important to activity. Possibly, these analogs with strong lipophilic capability may easily penetrate the cell membrane and interaction with the Dippu-AST receptor, consequently exhibit potent effects. However, the above hypothesis needs more evidences to validate. The results of CoMFA and CoMSIA model are showed in Table S1 (Supporting information). The predicted r2 for CoMFA (rtest2 = 0.878) was lower than that for CoMSIA (rtest2 = 0.891), indicating that CoMSIA had better predictive ability. The scattered plot of the predicted activity data versus the experimental data showed in Fig. S2 (Supporting information) and the values showed in Table S2 (Supporting information). The good correlations prove the robustness and good predictive ability of the optimal CoMSIA model. Two significant effects map (Fig. 3A (steric) and Fig. 3B (hydrophobic)) were built with CoMSIA method. In the region A (N-terminus) of Fig. 3A, the steric contours of the CoMSIA displayed a large green contour, which indicated the favorable effect of bulky groups on increasing the biological activities of molecules. For instance, bulkier groups such as -CH3 (II1-II3 with pIC50 = 6.040, 6.545, 6.710) in contrast to -H (I1 with pIC50 = 5.640) in region A could increase the biological activities. This is according with above result which the activity of analog II3 with p-CH3 was higher than that of II6 with p-F. This was also observed among molecules II3-II12 having F, Cl, Br, CF3 group respectively. The larger the substituent, the better activity it has. The order of inhibition activities are p-CF3 (II12) > p-Br (II10) > p-Cl (II8) > p-F (II6) and m-CF3 (II11) > m-Br (II9) > m-Cl (II7). From Fig. 3B, two white contours in region C (2 site amino acid at N-terminus) and carbon terminus respectively, indicated that introduction of hydrophilic substituents in these regions will benefit for inhibitory activity. That further pIC50 values are needed to illustrate this model. 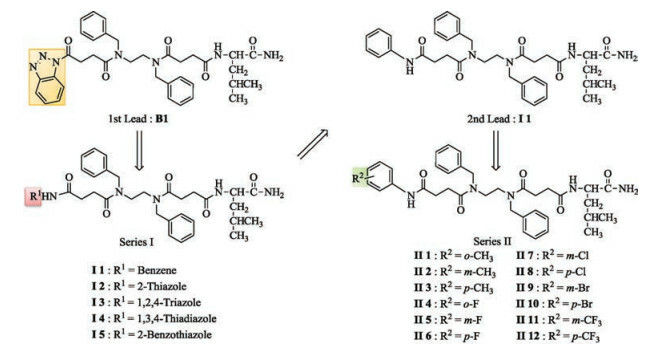 Two series of novel peptidomimetic analogs were designed and synthesized. The activity of inhibition JH biosynthesis showed that most analogs exhibited considerable activity, especially analog II12 (IC50: 0.08 μmol/L) exhibited similar activity to the lead compound B1 (IC50: 0.09 μmol/L). The preparation procedure was simplified and the production cost was reduced roughly. Primary structureactivity relationship revealed that para-substituent had an obvious influence on activity. The proper lipophilicity logP over 2) is favorable for activity. 3D-QSAR models were obtained with high accuracy and predictive ability. The CoMSIA analysis indicated that a significant steric arrangement, where bulkier substituents are aligned on the N-terminus region, positively correlates with activity. In addition, introduction of hydrophilic substituents in 2 site amino acid at N-terminus will be benefit for inhibitory activity. These results provide useful clues for further chemical modifications and the in vivo activity of some promising compounds will be tested in our next optimization work on discovering potential IGRs. We are very grateful to Professor Stephen S. Tobe for his kind help on bioassay of JH production inhibition in vitro. This study was financially supported by the National Natural Science Foundation of China (No. 21372257) and the grants from the National Key Research and Development Plan (No. 2017YFD0200504). Supplementary data associated with this article can be found, in the online version, at https://doi.org/10.1016/j.cclet.2017.11.022. S.M. Olieff, H.J. Mosson, J.P. Edwards, et al., Int. Pest Control 39 (1997) 44-45. A.S. Ripka, D.H. Rich, Curr. Opin. Chem. Biol. 2 (1988) 441-452. W.C. Chan, P.D. White, Fmoc Solid Phase Peptide Synthesis:A Practical Approach. New York: Oxford University Press, 2000.